First floor bathroom with tub and shower. 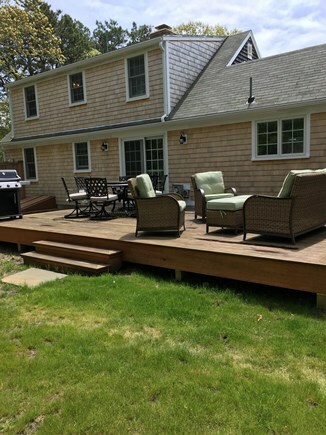 This classic, fully renovated 4 bedroom, 2 full bath Cape near the National Seashore, with many recent upgrades! It boasts a brand new, sunny, fully equipped kitchen with custom cabinets, quartz counter tops, and all new modern stainless appliances. An open floor plan shows off the home's roominess and flow. 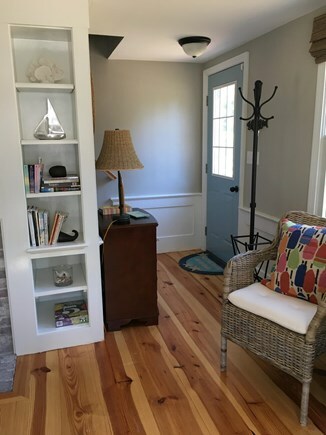 Wide plank hardwoods throughout the home give a vacation feel. 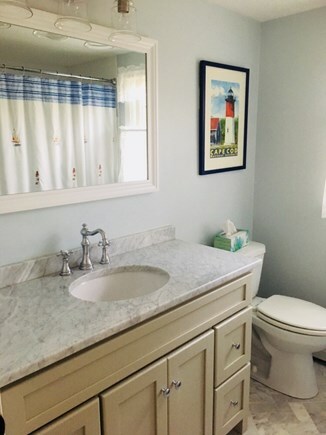 Both bathrooms have been completely redone, with accents in marble, glass and custom cabinetry. Each level holds 2 bedrooms and a full bath, providing opportunities for extended families. 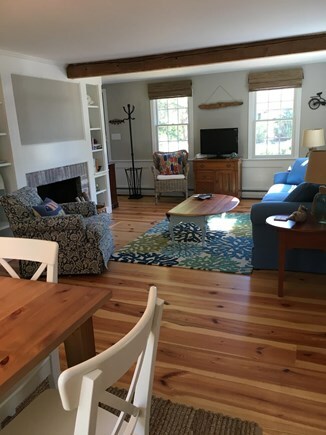 All four bedrooms have air conditioning, with the upstairs handled by central air that is being installed this winter, and the downstairs bedrooms handled by window units. There is a large outdoor mahogany deck, all surrounded by a huge flat yard (perfect for whiffle ball or frisbee) that provides privacy and natural beauty. With a custom mahogany hot/cold enclosed outdoor shower as well, it will leave you wanting to spend lots of time relaxing at the house. The property lies in a charming, secluded, safe and quiet, yet expansive neighborhood that is perfect for families and great for kids. The neighborhood backs up to high school athletic fields with basketball and tennis courts, baseball fields and a running track. 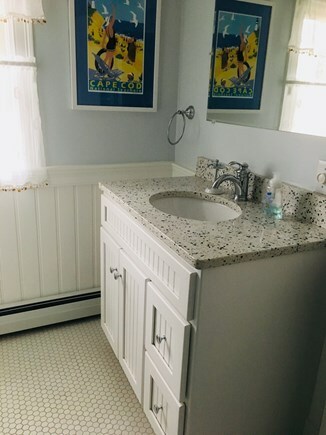 It is only 3/10 to the cape rail trail bike path, 3/10 to the National Park boundary and only a short bike ride to the National Seashore's Nauset Light Beach, with Coast Guard Beach and the National Park Visitor Center close by. Even the quiet sunsets of the bay beaches are only a few miles away. The home is a stone's throw to Provincetown's whale Watches, Dune Tours and souvenir shops. 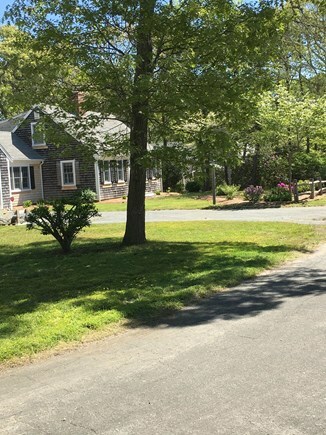 Even closer is Wellfleet, with its quaint village art galleries, restaurants, and the famous Wellfleet Oyster Festival. The Wellfleet Drive-in Theater and the Wellfleet flea market are must try's and sit only a little over a mile away. Other must try's include the Beachcomber, the world famous Arnold's Seafood, and Stewarts Restaurant. Everything a vacationer could want is a walk away. Mini golf, ice cream shops, and souvenir shops surround you. 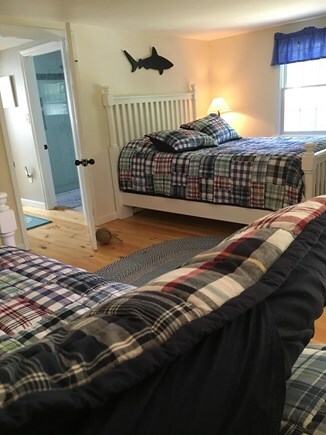 Additional availability info: We can negotiate an overlap for Wellfleet Oysterfest weekend if you act early. This is a Friday to Friday vacation rental. 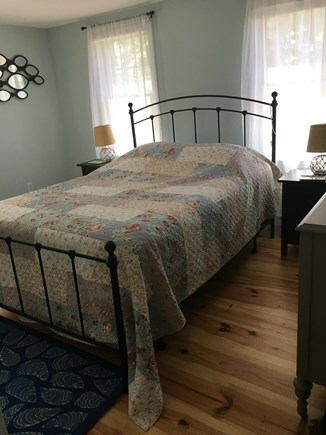 Additional pricing info: We offer a 5% discount off the entire stay for each additional week; mandatory $250 cleaning fee, State and local taxes of 12.45% will apply. Thank you the house looks great, as well as comfortable! Thanks for being so prompt. We had a great time. The house is in great shape. We had a wonderful week and thoroughly enjoyed staying at your place. I neglected to tell you what a fabulous time we had last summer! As always, your house was perfect, especially the backyard where we enjoyed some wonderful dinners and s'mores by the fire! Thanks so much for another great week. We enjoyed the improvements in the house and the bottle of wine! 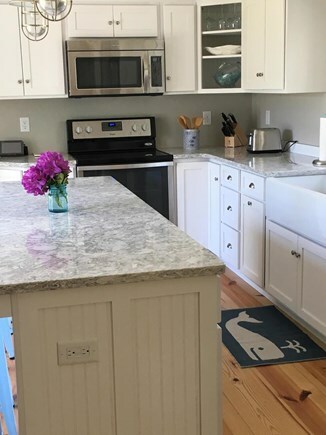 Especially love the kitchen backsplash and the beach photo over the fireplace. Thanks for the Keurig machine and outdoor table umbrellas. 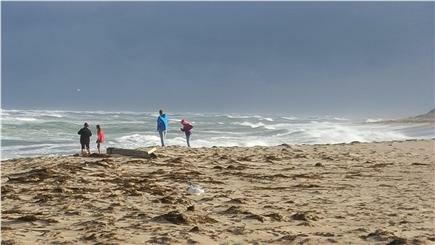 We had great weather and went to our favorite Coast Guard Beach every day. We’re looking forward to next year already. We are so happy we could share just how wonderful a spot this neighborhood is for a summer vacation. We are glad you enjoyed it. Thanks for the kind words. This was the best rental we have had in the seven years I have been going to the Cape. The owners covered every detail. The home is meticulously clean and beautifully furnished, It is also close to everything yet private and very quiet. We love being able to go to a different beach every day, and the proximity to the main road (route 6) was perfect. The owners are easy to get hold of if needed. It was a great family vacation home. We are thrilled that you and your family enjoyed the property. We really strive to make it nice for you and the other renters, and it is satisfying to know we are on the right track. Thanks. We hope you come back to us this summer. Thank you so much for the kind words. We appreciate it. We love our home and take a lot of pride in it. We are so happy we could share it with you and that you could experience a small taste of our little slice of what we consider heaven.